To manage all that in four years is astounding! Congratulations and a well-deserved pat on the back to you and all the staff. Can't believe you do it with less than 20 people, as well. 13 will be a lucky year for us all, I hope. Yeah, the smashwords search engine is a little erratic. Thanks Mark! It was nice meeting you at the self-publishing conference. Premium catalog approval for my book was 2 days. Looking forward to the improved discoverability algorithms. Happy 2013! Good review Mark, I don't miss anything you write here. I hope new writers will make 2013 the year they decide to write their own books and give it a try. The door is open and it takes nothing more than your best effort in writing a book, and publishing it for free. It doesn't get any more wide-open than it is right now. Write your book. Publish it. Revise as necessary. Re-publish it. The feedback you'll get from readers - is so valuable. Listen - and you'll improve. Take it personally, and you'll fail miserably. I know a small handful of new writers that published for the first time in 2012. A couple of them seem to have caught the bug, a couple have pulled back and don't seem so excited about ebooks because they didn't see huge success. Look at it as a long term play. Start writing today if you have the interest - and keep writing, keep revising books that are on the market already, change the covers, change the descriptions, change the prices, change the genre you write in. Figure out what type of book you write best - and start cranking those out. Writing books is your pension. Forget about getting something when you retire from the company you worked for over thirty years of your life. Forget about social security. Producing content in the way of ebooks is much more secure. You can hand them down to your kids as you pass on too! Best of luck and life to everyone in 2013. If you think you are a writer - you MUST give it a shot in 2013. 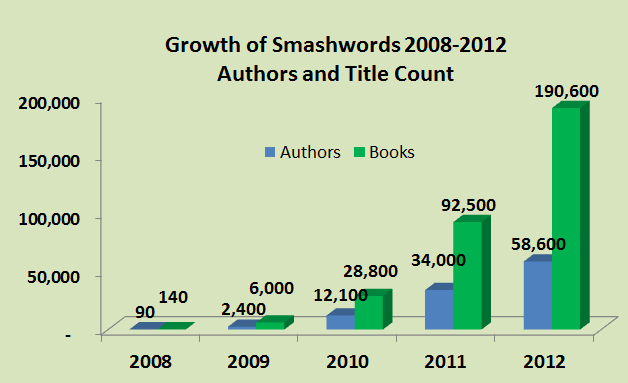 Congratulations to everyone at Smashwords on such a successful 2012! I've been publishing with Smashwords since May 2011 and feel as though I've kind of grown up with you - your company and the opportunities it offers just keep getting better and better. I've made mistakes - for one thing against all my instincts and your advice, I listened to someone else and removed my books from your site for a couple of months. Big mistake but I keep telling myself it's all part of the learning curve! I won't do it again for sure. I've learnt an incredible amount about the publishing industry through you and have enjoyed the journey immensely. Thanks for keeping pushing those boundaries and giving us writers more and more opportunities - I'm sure 2013 will be successful, busy and happy for all of you! 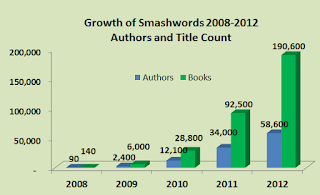 I did a lot of research on self publishing for over a year before making the decision to go with Smashwords. I heard nothing but praise about your company prior to me signing up with Smashwords and have nothing but praise for you after a year. Your growth proves that I didn't make the wrong decision. I hopped on board two years ago, and have been pleased all along the way. Keep it up! Yes, I'm one of those authors who left and who is now coming back. Tried Amazon's Prime thing but it was not worth the isolation. Maybe for some it is. Thanks for always keeping us informed with the best publishing insights, Mark. I published my first short story with Smashwords in June, 2010, and slowly built my back list since then, learning from each publication how to improve my writing, formatting and marketing. Thank you, Mark, for giving me and all the other authors a chance to find our readers. I look forward to any and all improvements on this exciting journey in 2013 and beyond. Great post Mark. Indie books are the new "green" way to shop, except now consumers feel they are benefiting real people with an internet presence instead of abstract rain forests or unhappy molecules of CO2. I jumped into self-publishing for the first time in 2012 when I got tired of rejections. I published two short stories and a novel. I have the same goal for 2013. My favorite feature on Smashwords is the ability to make coupons. I have used a lot of those over the past year to promote my book on Facebook and on my blog. Have enjoyed my success with Smashwords this last year and a half. Reports are still difficult for me to decipher at times, but the end of the quarter figures tell me about all I need to know...I'm selling. Thanks for all of your encouragement. Write on, authors! Some years back I went ona customer service course, where they talked about 'Delighting your customers'. I thought at the time you were as likely to 'delight a customer' as you were to win lotto. People are somewhat hard to please and expect six Ickes change out do a five. You have done it- consistently and continuously! Thanks Mark - I love the personal engagement you demonstrate and the "constant beta test" concept is exactly right. This business is evolving at lightning speed so you have no choice but to relentlessly evolve with it, leading the way where and when you can. My books are on KDP Select now but when the 3 months are up I'm looking forward to broadening to the Smashwords platform. You're building something good here. I rather like the clean, uncluttered, and sober design of the Smashwords site, and I hope the redesign that keeps being alluded to here will preserve these rare virtues. I watched from the sidelines for a couple of years before taking the plunge with Smashwords in August 2012. Mark, from the first page of the Smashwords style guide, I liked your style. Thank you and everyone at Smashwords. I will repost your review on my blog http://www.martyn51.blogspot.co.uk and pass it around my friends spreading the word about Smashwords and becoming an independent author. Seeing my name and the words Indie Author on Diesel as a Smashwords distribution partner was a special moment. Keep up the excellent work, more power to your people! Thanks for this excellent update and for all the improvements. Please note that faster response time on support inquiries and problem reporting is but one measure of customer service. The more important measure is the quality of the response, making sure the question is answered or the problem is corrected. Leading by example. Good work Mr. Coker. 2013 is going to be awesome! I've got 18 books published by a small publisher. 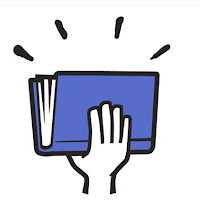 I've had 2 other books go through horrendous 'chasing' due to faltering companies and dubious practices (don't believe the contract that says all rights automatically revert to the author in case of bankruptcy. It doesn't - it all gets frozen until something is sorted out). After hearing about self-publishing from a few other authors, I decided to give it a go, and started with Smashwords. It's been awesome, I love it - especially knowing all rights are my own. It feels great to have such a hand in everything, from writing to editing to formatting to organising covers (thank you Joleene Naylor!). The sense of accomplishment is indescribable. And Smashwords has always been there to answer any queries. It's awesome! I happily tell people to give it a go. If you have a story in you, and you spend that time writing it, why shouldn't you have the pleasure of seeing it in print? And let's be honest - who can argue with the royalties? Sure, I still have to work , but I'm getting much better returns than I ever have before! Also, the amount of talent out there is great. I've stumbled across some great books by self-published authors that in all liklihood would have been overlooked by a big publisher. there loss, our gain! Thanks Smashwords - and Happy New Year to us all! If you can make the Smashwords store look like the Amazon store, you will become MASSIVE. I've been with Smashwords from '09 and have been too busy editing and writing to promote my books. My bad. Smashwords has been extremely responsive when I've had technical problems with their meatgrinder software in the past. A more powerful search engine would be a good addition. Thanks Mark for all your good work and may 2013 be a blockbuster year. Congratulations to you, Mark, and all of your colleagues at Smashwords who have accomplished such great things for indie authors! I've just published another book, the second book in a YA fantasy/mystery series, so I appreciate the series function you're talking about. Plus, I'm planning on releasing a serial novel sometime in 2013 (if I can rewrite the original novel to work as serial). My little dragon Miro is still lonely over at KDP Select, though, because Smashwords doesn't want to play with him (too big file size; we already talked about that on the other blog). I'm missing an announcement for increased file sizes here. Did I overlook it, or won't it come in 2013 after all? Your greatest contribution in 2012 was most probably the fight with Paypal and credit cards company which was won thanks to your valuable input. We owe you a great deal for that. On the Smashwords platform though, I must say that premium approval is not getting faster at all, and that distribution is still facing a lot of issues. I wish you could implement a ticket system for support, to avoid support requests to be omitted and allow better follow up on the time take to reply. Thank YOU, Mark, for all your hard work and your commitment to indie authors! Thank you, Mark. I appreciate the way you take care of authors. I've even learned to get along with THE MEATGRINDER! Very interesting, Mark, as usual. I've also taken your advice about writing a series and have just completed my second murder mystery which follows The Reluctant Psychic. This one is entitled, 'The Psychic Spy and the Mystery of Masterman's Retreat.' It is now with my editor so should be hitting Smashwords soon. We'll see if this catches on. I am almost ready to publish my book on Smashwords and I can't thank you and your co-workers enough. I've read every scrap of info you have on your site and all of the instructions, advice and tools have made my experience so smooth and enjoyable. This is my first novel and I debated and debated whether or not to attempt to publish, fearing that the trials of publishing would ruin the experience. I found out about Smashwords through Jamie McGuire and it has replaced my fears with excitement and a world of possiblities. Thank you! I'm so glad to see the improvements you've listed, especially the update of the smashwords site format. It is fully functional as is, but appearances do matter. You have always suggested that we get a professional cover for that very reason and I believe you. I think a professional look will only enhance the buyer experience. Also, having a better search capability for books will certainly improve sales. More than once I've given up sifting through titles trying to find certain types of books. Multiple filter options would be great. You have a lot of titles on this site. A lot of titles! I would like to make one suggestion and that is to show the number of downloads to readers on the book page. Often I have wanted to know how popular the title was that I was looking at. I suppose that could be an option for authors, in case someone didn't want that information shown. So, congratulations on having the best site for ebook authors. I'm really looking forward to seeing the changes you mentioned for this year.